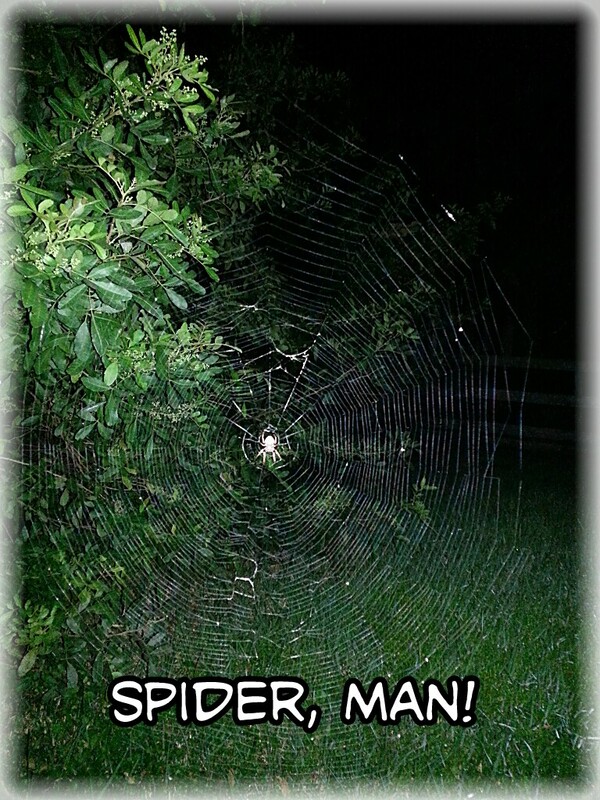 Two nights ago I was walking around back to bring the dogs in when I almost walked right into an enormous spider web. It was a magnificent web, strung delicately and perfectly from the branches of a tall bush to the ground. It was probably seven or eight feet tall, tall enough so that the center of the Web, the bullseye, was practically at my own eye level, putting me face to face with the spectacular web's proprietor. The spider was right there in the middle, chomping on some smaller insect that had fallen prey to the sticky strands, as intended. I didn't have my phone to snap a picture, and I didn't think I'd get a good shot anyway given the darkness. I made a mental note to try and catch a picture of it when I put the dogs out again in the morning. But in the morning the web was gone. All that work, the perfect construction, form and function, just for an evening's feast. 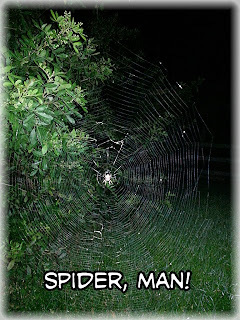 As slick and symmetrical as it appeared, the web could not withstand the wind, rain and other vagaries of the night. Oh well. So much for getting a picture of the web. Then last night, once again I went to retrieve the dogs and lo and behold, there was the web again. Not quite as big this time, but almost in the exact same place, and once again with my friendly neighborhood spider right smack in the middle. This time I got the shot. Every day the spider has to create to survive. He has to do the work to spin his web, and do it well. Do it as perfectly has he can. Even though that work may only last the day, it is the most important work he can spend his time doing. Again, and again, and again. He's not discouraged when the wind (or a person) ruins his work because he knows he is fully capable of doing it again, and maybe even more perfectly the next time. He makes every web he creates count. He has to. Mobile Is Dead, Long Live Mobile! I've been involved with the Mobile Industry for a long time, and for more than 10 years there has been a "buzz" about the so-called "year of mobile." Has it already passed? Is it finally going to arrive? What do you think? Last week I gave this presentation to the South Florida chapter of WITI (Women In Technology International). I've given many presentations over the years, and I enjoyed giving this one. Since I am working with cartoonist Hugh MacLeod (@gapingvoid) at Social Object Factory, I used a number of Hugh's insightful cartoons to illustrate my talk, which is called "Mobile Is Dead, Long Live Mobile." There is no question that the smartphone has changed the face of mobile, but there are other forces at play as well. As addicted as we may be to our smartphones, we are also now creatures of multiple devices - "Digital Omnivores" as comScore calls it. Thanks to the prevalence of apps and the ubiquity of "the cloud" the idea of mobility goes way beyond our phones. So, while an older vision of what mobile is may well be dead, our multi-device, cross-platform mobility is most certainly here to stay. Long live mobile! I'd love your feedback on this presentation. For more information about Jeff and to book him as a speaker, please visit http://about.me/sass or http://www.jeffreysass.com/speaking. Cartoons courtesy of @gapingvoid.